I can't think of any time he sustained keeping a character in shadow for this long. Piecemeal reveals of guys like Crocodile sure, but this is weird. Especially when hes shown off the rest of Kinemons group pretty much immediately upon naming them. Wasn't Jinbe mentioned way back in East Blue? But should we deduce from Hiyori speech that he has been in prison for 13 years ? 7 years with Hiyori, 13 in Udon, definitely not the guy with Crocus. Most likely Kawa being imprisoned is related to Komu being under Kyoshiro's vigilance. So yes, it seems he's been in prison for 13 years. Well a visit to an old friend is not incompatible with being with Hiyori all those years. Name drop is one thing but the silhouette or partial reveal is another. Jimbei used to be top dog when it came to that but now Vegapunk has long since smashed that record. Kawamatsu is in this arc talking and interacting with characters for a long time now and he's still not revealed. Jimbei and Vegapunk were mystery beings who resided far from the current events in which they were named. I just hope it means there is something really unique about him. I suppose as a Kappa thats given but I guess I'm imagining something even more special. So is it safe to assume this place is where Rayleigh picked up that Goken projection ability? I like that Luffy keeps going to all these places that are, like, way ahead of others in terms of using abilities. Like how Skypiea was the first place we saw use of Haki before we knew what Haki (observational, at least) was. 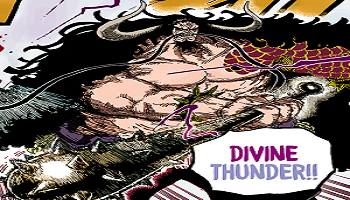 Or in Amazon Lily where we learned about Armament Haki. Now we're learning about this variant on it which is awesome. I wonder if the name being Go-Ken, with 'go' meaning 'five' is a hint that it'll play a role in developing a Gear 5? Is incompatible with him in prison since he's been there for 13 years and that Crocus scene happened like one~two months ago. Thank you so much for your hard work, Bellisario!! In this chapter, it’s revealed that Hyou was known as the Mighty Blade (豪剣). 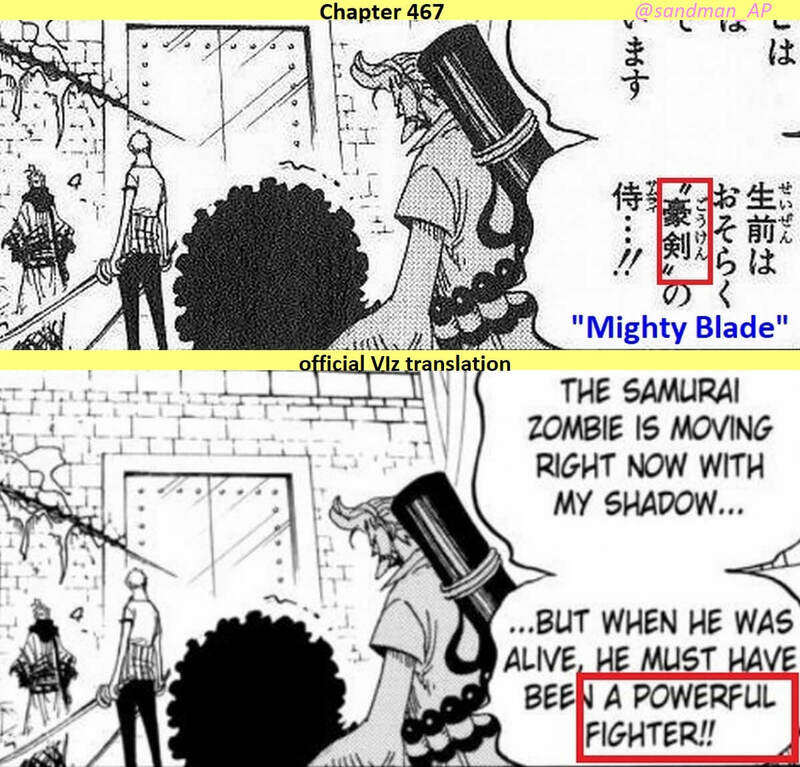 Actually this “Mighty Blade” (豪剣) term was already used in the chapter 23 (volume 3), 195 and 467. Both Zoro and Ryuma are classified as Mighty Blade type swordsman. Sadly, there is a translation inconsistency in Viz version..
I’m sure Stephen would not have made such a mistake if he had been an official translator at that time. Last edited by .access timeco. ; April 15th, 2019 at 08:27 AM. Originally Posted by .access timeco. Friggin' translations. But I still think it'll become a part of a Gear 5 form for Luffy. Thanks so much for the clarifications! I've always enjoyed reading them every week. Thanks for doing this every week! It's really interesting. Anytime! Glad to hear people still enjoy reading them. About the "truth"/"true nature", I've noticed she uses the word 素顔 sugao, that literally means "natural face". It's used to describe a woman's face without makeup (like Hiyori is without the oiran makeup now) or, figuratively, the "true nature" of someone as opposed to how they show themselves to the public eye. So I think VIZ's version is the most accurate here, because she's talking about what's under the oiran painted face in terms of both identity and personality. Both of these facts are really interesting! Thanks for expanding on it some more. It's really cool to hear more about how it was originally written in Japanese in addition to just how different people translated it. Just to check, is the official version always the correct one which makes JB and MS off in translation? I've always been reading JB and I found it them to be quite good. I wouldn't necessarily say that it's always correct--every translation has its flaws here and there--but I do think that VIZ does a good job of phrasing the translations in a way that flows the most smoothly in English. Sometimes as a result, it's a bit less accurate to the original Japanese than the scanlations are (which are often times more literal), but sounds a good deal more natural. That being said, I like Jaimini's Box in its own way, too. I recently did a re-read of Wano, and I used Jaimini's Box for the re-read rather than VIZ. I like seeing the Japanese honorifics (which JB usually uses and, naturally, VIZ cuts out) and reading the translator's notes. 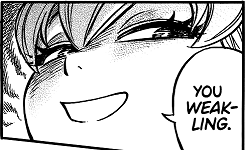 Also, I'll admit I'm not a fan of how VIZ has been leaving some words untranslated this arc rather than going with the best English approximation possible (e.g. keeping "tsujigiri", "oiran", "Akazaya Nine", "Tobi Roppo" written like that rather than translating them). And then there are things like "Zolo" and "Teech"... (though those are choices made long ago that we're stuck with now, see below). Overall, the translation differences are a big reason why, despite personally having a VIZ membership and reading that version of the chapter every week when it comes out on Sunday, I don't want to give up reading the scanlations every Thursday-ish and can understand others not wanting to either, because I like reading multiple different translations of the chapter to get a better idea of what's happening and being said. 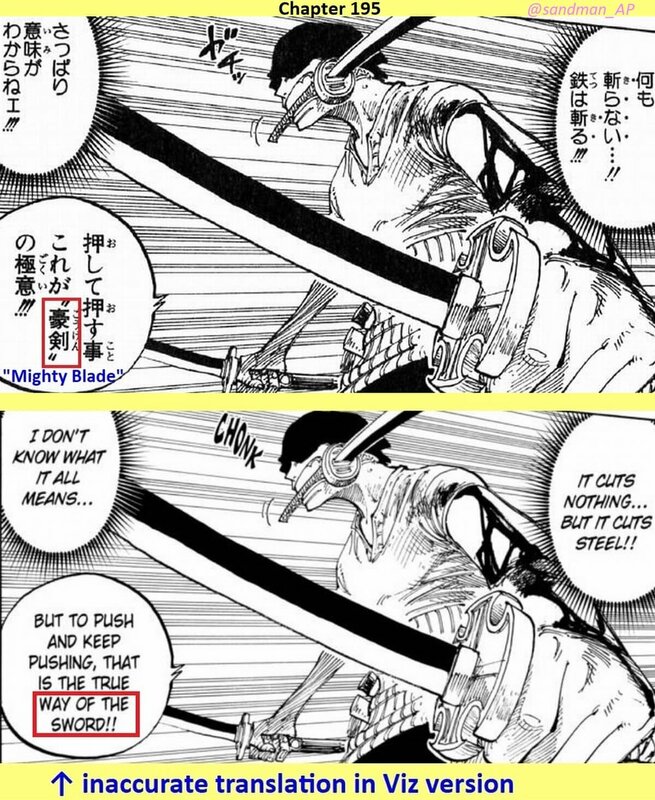 Is Zoro's name Zolo in the official translation(s)? Sadly, "Zolo" is what's used in the official version, yes. I believe that the main reason for this is that, when 4Kids first dubbed the anime in English (which was a most unfortunate affair), they went with "Zolo" rather than "Zoro" to avoid copyright issues (with "Zorro"), and when VIZ started publishing the manga, they followed 4Kids' example and went with that as well (and it may have also been for the same copyright issues, not sure). These days, I don't think it would be a problem (FUNimation uses "Zoro" in both their subs and the dub), and I'm sure everyone would like it changed, but for consistency's sake, translators since then have been required to stick with "Zolo" because that's what's always been used. This is why, even for wikis and other sources that use the official VIZ names/spellings of characters (e.g. spelling it "Jimbei" rather than "Jinbe" or "Jinbei"), "Zolo" is an exception that they don't use because that was never what his official name was meant to be, and honestly, nobody really likes it and it's just kind of a sucky thing that we're stuck with. No lie, it's actually part of the reason why I refuse to buy the VIZ volumes (since if I want to do a re-read, I'm far more likely to do it online with a different translation anyway) and just stick with the subscription, haha. Last edited by BellisarioFaith; April 15th, 2019 at 09:15 AM. No, but the crazy similarity in clothing design indicates a connection, potentially. Yeah. It's a merchandising copyright thing. Because of Zorro, they couldn't license the name out. So we get Zolo. Similar situation to what happened with Lupin III for a long time, he had to go by Rupan or Wolf until the Arsene Lupin copyright elapsed. Viz actually STARTED with Zoro, then changed it to Zolo about a year in. All the early Jump volumes, and the first printings of the first couple volumes all have Zoro. Zolo also carried over to figures, games, and other merchandising. It was an overall branding decision made beyond Viz's decision. Named but not shown. Same with others like Dadan or Sabo or Ivanokov or Fisher Tiger or current longrunner Vegapunk. They weren't kept in absolute silhouette for dozens of images even after talking directly to others. They might have had a one panel tease along the way, but once we actually got a scene with them in it, we saw their look in full. Bone spitter has been in multiple scenes now, and referenced and named in full, talked to people, and still kept in absolute shadow, or had his appearance covered by his hat, even in shots where he's not in the cage, even after it basically being confirmed he's a Kappa. So... something is gotta give. This is a much longer hide than Oda usually does. So I'm really inclined to hope he's got a great design coming he just doesn't want to give up. 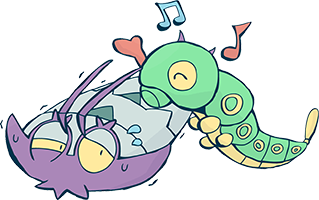 It could also be that he's not a Kappa but a space alien or something, and obviously that would need to stay under wraps for a bit. Last edited by Robby; April 15th, 2019 at 12:39 PM. To support Viz hosting all Jump manga for FREE and day of release, Arlong Park will now support the official release. Official chapter discussions now start Sundays at Noon, EST. Please do not post threads when scan sites release their version, and just discuss those releases in the spoiler thread. Tell me, how do we know when that scene happened? Because it was part of the "From the Decks of the World" cover story that showed the characters reacting to the news of the SH coming back after their 2-year absence. I don't get it, so your argument is that within those 7 years, Kawamatsu just suddenly decided to leave Wano to go all the way to Twin Cape to meet Crocus? And without Hiyori on top of that? Pretty sure he had more important things to do. As far as I can recall, evidence has generally always pointed towards cover stories happening more or less concurrently alongside the main story, as opposed to any random old time. Even if that isn't always the case, you're essentially arguing that that cover story is something that happened more than 13 years ago. That's a massive leap to make for a character whose only resemblance to the mysterious character's is that they share a similar hat. If he's a kappa maybe that's a precursor to other kinds of Yokai coming out of the woodwork? That might be fun, a hundred different Yokai helping battle against the "Hundred Beast" armies of Kaido. I had just figured Kawamatsu wouldn't fully appear until he got out of his cell. Which chap was this again? If it was the one that started from Zoro's perspective I freaking loved it. So nice being able to spend more time with the characters in simple settings. 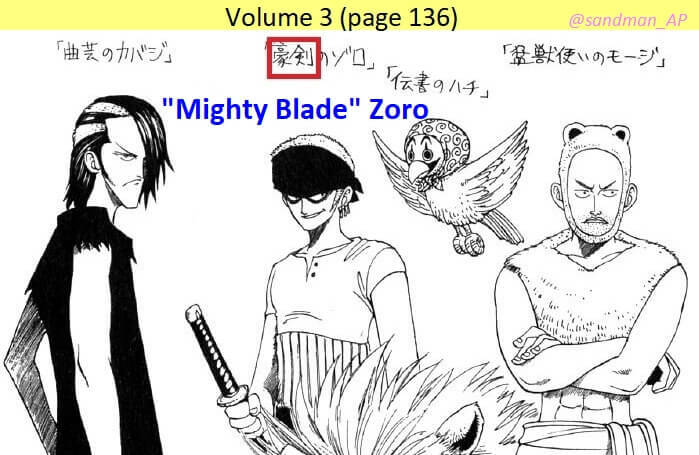 Maybe Oda is holding off on the Kappa design because we will recognize something on him. If he has a trait as recognizable as a swirly eyebrow, for example. Is it a kappa or a human or that ate the mythical kappa devil fruit? Place your bets. He is shown swimming in this chapter. Yeah, because he was swimming it's possible that he's a 'realistic' (for the OP world) twist on something that's been introduced. Possible mink, possible 'alien' that has a twist on it to make it appear what is commonly believed to be a kappa. Kinda like Brook was a 'realistic' twist on the gashadokuro.